Native American Indian art of the Southwest includes kachina dolls, sandpaintings, pottery, woven blankets and rugs, basketry and jewelry. Because Native Americans take great care and time in everything that they do even the most simplistic objects can be considered art. Native American Indian Art of the Southwest is deeply spiritual and closely tied to Mother Nature. Through symbols, patterns and designs Native American Indian art of the Southwest displays the everyday life, beliefs and long-lasting traditions of the Indian tribes. One of the more important forms of Native American Indian art of the Southwest is basketry. Developed over many years by Native American tribes baskets were created by weaving reeds and cornhusks. The reeds and cornhusks were then dyed to make interesting tribal patterns and designs. The baskets were used for rituals and food transportation. 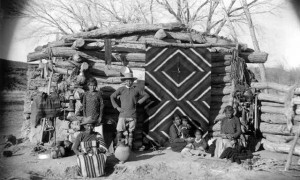 Blanket and rug weaving is also a very common Native American art history. Women would spend many hours weaving threads together to create incredible colorful blankets in a rainbow of patterns and designs. The Navajo tribe is very well known for their hand woven blankets. It is believed that Spider Woman, after weaving the universe, came to the Navajo to teach them how to weave. It is a long-standing tradition that continues to pass from generation to generation. Jewelry is very important in Native American Indian art of the Southwest. It is used for adornment, protection and rituals. Although jewelry making and beadwork were prevalent before Europeans settled, Native Americans did not begin to experiment with beadwork and metalwork to a large degree until, through the Spanish and the Europeans, Native Americans were exposed to glass. Pottery, like basketry, was used for both practical and spiritual purposes. The early cultures of the Southwest, like the Hohokam and the Anasazi made pottery. Pottery, like all things, is said to have a spirit. It is a product of the Mother Earth: her body forms the walls of a vessel; her bounty provides the paints to decorate it. One piece of Native American Indian Southwest art that is completely unique to Native Americans is the dreamcatcher. The dreamcatcher developed in the Ojibwe tribe symbolizes holding onto good things in life, while the holes in the catcher are there to filter out bad thoughts and feelings. The teardrop shape was hung outside the house in order to protect children from having bad dreams. Native American Indian Arts of the Southwest have left an impact in mainstream culture and continues leave an impact on society. Pieces like the dreamcatcher have become iconic and are used for everything from CD covers, tee-shirt logos and ideas for movies. Native American art of the Southwest continues to develop while maintaining its rich culture and tradition.